These measurements were made with Linrad running on a PentiumIV 2.7GHz computer with a modified Delta44 soundcard. The RF signals were converted to audio by use of the WSE converters RX2500, RX10700, RX70 and RX144 or RXHFA. The RX144 and RXHFA units were prototypes, the others were regular units. The unit under test was connected to a high power attenuator followed by an ordinary step attenuator which was connected to the RXHFA or RX144 unit. The step attenuator was adjusted to place the signal approximately 1.5 dB below A/D saturation. The spectral purity of a continuous carrier is listed in table 1. In this table spurious signals are not included. For spurs, look at the screen dumps. Note that the mirror image that is produced because RX2500 is a direct conversion receiver is located symmetrically with respect to the spectrum midpoint. This receiver/Linrad spur is suppressed by 70 dB in these measurements except for the crystal oscillator which was measured several weeks earlier, immediately after Linrad was calibrated. All except one of the tested transceivers produce broad SSB signals with a lot of splatter in surrounding channels when operated in "normal" mode with the ALC active. The TS50 is an exception, it does not show signs of an "overactive" ALC. One or several screen dumps from the Linrad display in tx test mode were saved for each unit showing the spectrum centered 25 kHz from the SSB signal. To see these spectra, click on the links below: Unfortunately two spectra were taken with too high signal level which caused the A/D converter to saturate at some point in time. I do not think this has affected the result, but those spectra are not reliable. A/D saturation does cause spurious signals and although the saturated spectra do not look like they have contributions from saturation it can not be excluded. (I will add a warning message in Linrad to make sure saturation is not easily overlooked so I will not repeat this mistake.) The margin to saturation is shown in the lower left corner of each screen dump and it should not be zero. Two transceivers, IC718 and IC7800 allow manual transmit gain reduction. These rigs give clean signals when the ALC is made inactive but they do not give acceptable interference levels when the ALC is acting. Table 2 shows the peak splatter level in 2.4 kHz bandwidth in dB below the peak power in 2.4 kHz bandwidth. Since the mechanism of the interference is too much gain in the ALC loops with an associated oscillatory behaviour of the ALC action, the interference sometimes has equidistant maxima. To give a true representation of the interference, table 2 shows the highest interference level at or above each frequency separation. An over-active ALC causes keying clicks with a characteristic spectral pattern. The DX70TH is a typical example. The IC7800 shows the same phenomenon at a lower level, but when the IC7800 is operated without ALC, the clicking sidebands disappear completely as can be seen in the link below. All transceivers were keyed by hand in a normal fashion. For some of them the spectrum of a single key-down and perhaps a single key-up was recorded. Other rigs were tested with a 20 Hz automatic keyer. The length of the space from the end of the previous mark may influence the voltage swing on the ALC line, something that depends on the time constants in the design. This is why it is important to test the units with normal hand keying with variable speed and word spacings. 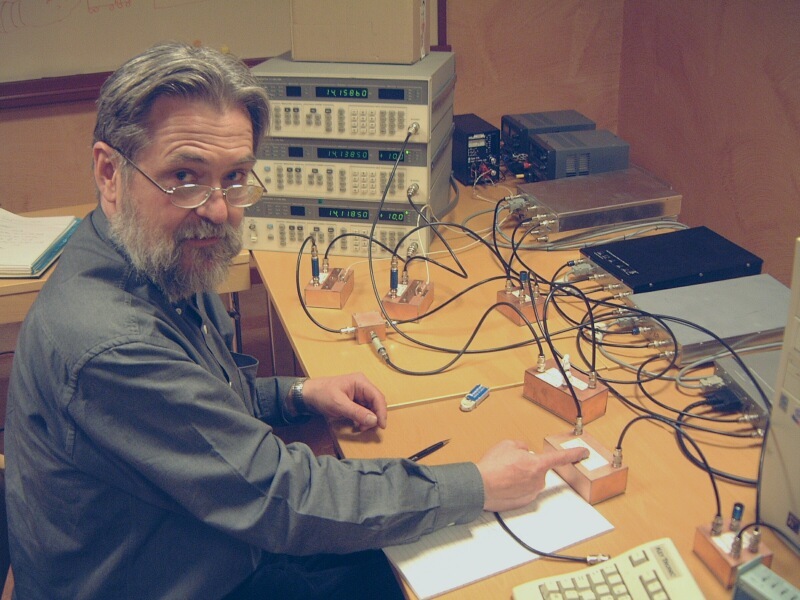 Testing with only a 20 Hz keyer that gives 50 % duty may not tell the whole story. Keying clicks are seen in these spectra as a separation between the peak power (green) and average power (red) above 12 dB. As can be seen in these links, the DSW40 is unacceptable because the key-down is abrupt. Probably the antenna switch is forming the envelope. The key-up is beautiful. The DX70TH and the FT817 are unacceptable because of ALC generated keying clicks. The MFJ9020 produces unacceptable clicks both at key-down and key-up for unknown reasons. Some of the transceivers were also tested in a narrow frequency range. These spectra are linked to below. The level of the keying clicks is listed in table 3. The data is from the wideband spectra and shows the peak power of the keying click in dB below the carrier. Model           Band      Keying clicks. -dBc in 2.4 kHz. Table 3. Peak power in 2.4 kHz bandwidth in dB below the carrier for keyed transmitters. The table gives the worst level at or above the listed frequency. Numbers preceeded by N is peak power values that are consistent with the average power level which is an indication that keying clicks are not present. For details, see the spectrum graphs. Table 3 is discouraging. Only IC718 and TS50 have proper keying but the TS50 suffers from strong sideband noise as can be seen in table 1. The keying clicks from the IC756PROII are not very strong and they are probably generated by the ALC loop. When the IC7800 is run without ALC, the keying is excellent, but amateurs probably do not use it like this and with the ALC enabled the keying is not good. Table 4. Sideband noise at 20 kHz frequency separation from continuous carrier. Receiver measurements take more time than transmitter measurements. At the SSA 2004 meeting I only looked at the receiver of the IC7800. The noise figure of the IC7800 was measured as 18.4 dB with the preamplifier off. The power level of an off channel signal required to reduce the S/N of a weak signal by 3 dB is listed in table 5. I did not see any sign of compression so the receiver is limited by sideband noise in the range of frequency separations tested. The LO sideband noise levels corresponding to the observed power levels are also listed in table 5. The weak signal was placed at 14.1599 MHz, the center of my notch filter. Table 5. Dynamic range of the IC7800 receiver. P is the level of a strong signal that reduces S/N of a weak signal by 3 dB. The corresponding LO sideband noise level is listed in the last column. This table originally contained data points down to 1 kHz frequency separation. The data was inconsistent with the LO sideband noise as observed in the transmitter test at 1 and 2 kHz separation, therefore all the points below 10 kHz have been removed since the error may have been that I have forgotten to take the effect of the notch filter on the strong signal into account. The notch filter is flat with 1 dB attenuation above 10 kHz separation and the values of this table are probably too good by 1 dB. The inaccuracy of the signal generator adds an uncertainty of perhaps 2 dB because it enters both the power measurement and the noise figure measurement. The true value at 10 kHz should be in the range -131.9 to -135.9 dBc/Hz based on these error estimates. All the data points have the same error limits -1 to +3 dB. The transmit side is (as usual) not quite as good as the receiver. The wideband amplifier noise of the transmitter sets the limit at about -142 dBc/Hz. LO phase noise is the dominating tx noise only at frequency offsets below 20 kHz or so. When trying to measure IP3 at 20kHz for the IC7800 I get the result listed in table 6. The measurement is done with a 14 MHz crystal notch filter which is not quite good enough as can be seen from the data. The data in table 6 is consistent with the published value of +40 dBm. Table 6. Attempt to measure the third order intermodulation of the IC7800. It is obvious from this table that the crystal filter used is not good enough. The data is consistent with the published IP3 value of +40 dBm.